Marder IIPz.Kpfw. 38 (t) n.A. The Jagdpanzer 38(t) Hetzer is a German tier 4 tank destroyer. In 1943, the Wehrmacht were experiencing a dire shortage of StuG III tank destroyers because the joint U.S.A.-U.K. air raids caused considerable damage to the Alkett company's factory that produced these vehicles. 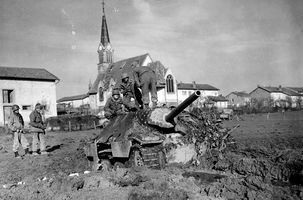 December 1943, a decision was made to utilize the working capacities of the BMM company in Prague to start production of tank destroyers. Components of the Pz.Kpfw. 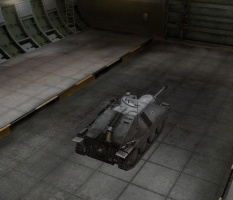 38(t) tank were widely used in the new vehicle. The first prototypes were produced in March 1944. More than 2,800 vehicles were built by May 1945. It is a very different tank from its predecessor, the Marder II. Initially, its poor speed and restricted arc of fire seem to be a downgrade from the long-range firepower of the Marder II; a point that provokes a lot of mixed opinions from players. It takes some time, and a few upgrades, to unlock the Hetzer's true potential and allow its excellent sloped armor, low profile, and powerful guns to come to the fore. Tier 4 and under tanks will have fear to the Hetzer due to the extremely powerful 105 mm gun that can one shot all t3 and most t4 tanks. The Jagdpanzer 38(t) Hetzer leads to the StuG III Ausf. G.
Lower plate armor can be penetrated by many tanks. The stock Hetzer isn't terrible. Its starting gun is identical damage wise to the Pak 39 L/48, and just 8mm short of penetration for AP. 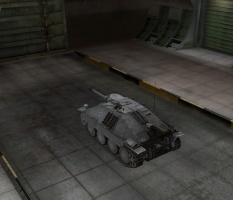 However, the stock engine is equal to crap, making the stock Hetzer extremely slow. Fortunately, the engines aren't very expensive to research. A single good match with the daily 2x bonus can net you the Scania Vabis 1664 engine. It plays very differently from the Marder II, mainly in that it features very bouncy frontal armour - but it doesn't get the powerful top gun Marder II had. Instead, it gains the fast firing Pak 39 L/48, which is pretty accurate; or the infamous 10,5cm StuH 42 L28, a derp gun that can one-shot a lot of lower tier tanks (and some higher tier tanks with careful aim), but lacks penetration. You should mainly load HE with this gun. 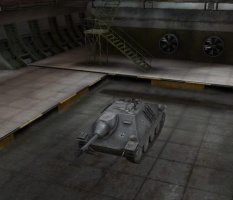 Whichever gun you choose, try and play it as an ambush tank. Its high camo value makes it hard to spot, so you can stay hidden until the moment you fire. A Camo Net helps a lot, and a Rammer is practically needed with the 10,5 cm. The 10.5cm howitzer that you are able to unlock on the Hetzer has the option of using AP rounds with 63 penetration, or heat rounds with 104 mm penetration, but these rarely penetrate, so using them is advised against (please consider that in battles that the hetzer is in the top 5 , it is more preferable to use ap, even it has only 63 mm of pen). The HE rounds can bring quite a lot of damage(410 dmg average), especially if you shoot at the tank's weak spots. Therefore, the Hetzer is an excellent ambush tank and a decent sniper with the 7.5cm L/48, and can sustain a surprising amount of damage, provided you can keep the enemy within your frontal arc. The side and back armor are very thin, so if it is flanked it will be destroyed without mercy. The Hetzer's ammo rack is another problem since it's rather close to the top of this tank, making it quite vulnerable to artillery fire. Additionally, the lower glacis plate is significantly thinner than the thick upper glacis, so that the Hetzer's front is quite sturdy, but at the same time far from invulnerable. This sets the tone for much of the German tank destroyer line. Be aware that the heavy, sloped armor is increased in effectiveness at range - very few guns with 100mm penetration or less will penetrate you ever frontally and many guns higher than that also have a good chance of bouncing. Keep your frontal armor at the enemy, and put distance between you and the enemy. The front armour is extremely slanted and this has a tendency to bounce a lot of shots (almost every shot from your own tier or lower). The drivers view port is the sole weak point here, which is pretty small in itself. The rear and side armour is paper thin, so wherever possible, flank this TD and don't take it head on unless you can pen the frontal armour. Regardless of whether you can penetrate its frontal armour or not, it can do a lot of damage with the derp gun. It can spin on a dime, but is as vulnerable to detracking as any turretless TD. First research up to the Scania Vabis 1664 engine. Next research the upgraded suspension for increased traverse speed and weight capacity. Now research your gun of choice. The upgraded radios are exclusive to the Hetzer. Research the first one, but don't bother with the second one unless you intend to keep it. After that should be the final engine, which will give the Hetzer decent mobility and very good traverse speed (in excess of 45 deg. per sec). The Jagdpanzer 38(t) (Sd.Kfz. 138/2), later known as Hetzer ("baiter"), was a German light tank-destroyer of the Second World War based on a modified pre-war Czechoslovakian Panzer 38(t) chassis. The project was inspired by the Romanian "Mareşal" tank destroyer. The name "Hetzer" was, at the time, not commonly used for this vehicle. It was the designation for a related prototype, the E-10. The Škoda factory (for a very short period) confused the two names in its documentation, and the very first unit equipped with the vehicle (for a few weeks) applied the incorrect name until matters were cleared. However, there exists a memorandum from Heinz Guderian to Hitler incorrectly claiming that an unofficial name, Hetzer, had spontaneously been coined by the troops. Post-war historians, basing themselves on this statement, made the name popular in their works. The vehicle was never named as such in official documents. The Jagdpanzer 38(t) was intended to be more cost-effective than the much more ambitious Jagdpanther and Jagdtiger designs of the same period. 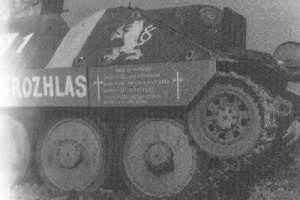 Using a proven chassis, it avoided the mechanical problems of the larger armored vehicles. It was better armored than the earlier Panzerjäger Marder and Nashorn with a sloped armor front-plate of 60 mm, sloped back at 60 degrees from the vertical (equivalent in protection to about 120 mm), carried a reasonably powerful gun, was mechanically reliable, small, and easily concealed. It was also cheap to build. The Jagdpanzer 38(t) succeeded the Marder III (based on the same chassis) in production from April 1944: about 2,584 were built until the end of the war. The older Marder III Panzerjager-series retained the same vertically-sided chassis as Panzer 38(t). In the Hetzer, the lower hull-sides sloped slightly to increase the available interior space and enable a fully-enclosed fighting compartment. Because of the fully enclosed armor, it was 5 tons heavier than the Marder III. To compensate for the increased weight, track shoe width was increased from 293 mm to 350 mm. Additionally, in late 1944, Guderian ordered the petrol engine replaced by a 190hp air-cooled Tatra Type 928 diesel engine, a result of Germany's rapidly diminishing supply of petrol fuel. This change was not immediately implimented to prevent disruption of production, but by spring 1945, Tatra diesel-powered Hetzers were emerging from factories. The Hetzer equipped the Panzerjägerabteilungen (tank-destroyer battalions) of the infantry divisions, giving them some limited mobile anti-armor capability. After the war, Czechoslovakia continued to build the type (versions ST-I and ST-III for training version: about 180 units built) and exported 158 vehicles (version G-13) to Switzerland. Most vehicles in today's collections are of Swiss origin. By order of Adolf Hitler in November 1944, a number of Jagdpanzer 38(t)s were refurbished straight from the factory with a Keobe flamethrower and accompanying equipment instead of the normal gun. The flame projector was encased in a metal shield reminiscent of that of a gun barrel, and easily prone to damage. 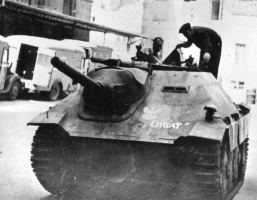 Less than 50 of these vehicles, designated Flammpanzer 38, were completed before the end of the war, but they were used operationally against Allied forces on the Western Front. Further variants were a Hetzer carrying the 150 mm sIG33/2 Howitzer, of which 30 were produced before the end of the war, and the Bergepanzer 38(t)Hetzer, a light recovery vehicle of which 170 were produced. Plans were made to produce other variants, including an assault-gun version of the Hetzer carrying a 105mm StuH main cannon, and an anti-aircraft variant mounted with a flak turret. The war ended before these proposed models were put into production. The Jagdpanzer 38(t) fitted into the lighter category of German tank-destroyers that began with the Panzerjäger I, continued with the Marder series, and ended with the Jagdpanzer 38(t). The 75 mm gun fitted on the Jagdpanzer 38 (t) was a modified 75 mm Pak 39 L/48, very similar to the late Panzer IV marks. The 75 mm kwk 40 L/48 could destroy nearly all allied tanks in service at long ranges, and its fully-enclosed armor protection made it a safer vehicle to crew than the Marder II or Marder III series. The Jagdpanzer 38(t) was one of the most common late-war German tank-destroyers. It was available in relatively large numbers and was generally mechanically reliable. Also, its small size made it easier to conceal than larger vehicles. Like some other late-war German SPGs, the Hetzer mounted a remote-control machine gun mount which could be fired from within the vehicle. This proved popular with crews, though to reload the gun, a crewmember needed to expose themselves to enemy fire. Its main failings were comparatively thin armor, limited ammunition storage, as well as torsion-bars and drive wheels that were prone to failure due to the increased weight of the Hetzer body on the Type 38 (t) suspension. The Hetzer's actual name is Jagdpanzer 38(t). From August 1944 to the end of the war, German armoured vehicles were painted with a 3-colour camouflage of dark yellow base covered with dark green and reddish brown patterns. Hetzers produced after summer of 1944 featured small yellow and green spots on top of the standard 3-colour camouflage. 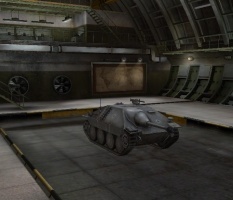 In World of Tanks, however, the Hetzer is in early Panzer Grey. The 7,5 cm Stu.K. 40 L/43 gun was mounted on the G-13. This variant was only used by the Swiss Army. The 10,5 cm howitzer configuration is fictitious. This page was last modified on 18 April 2019, at 09:52.